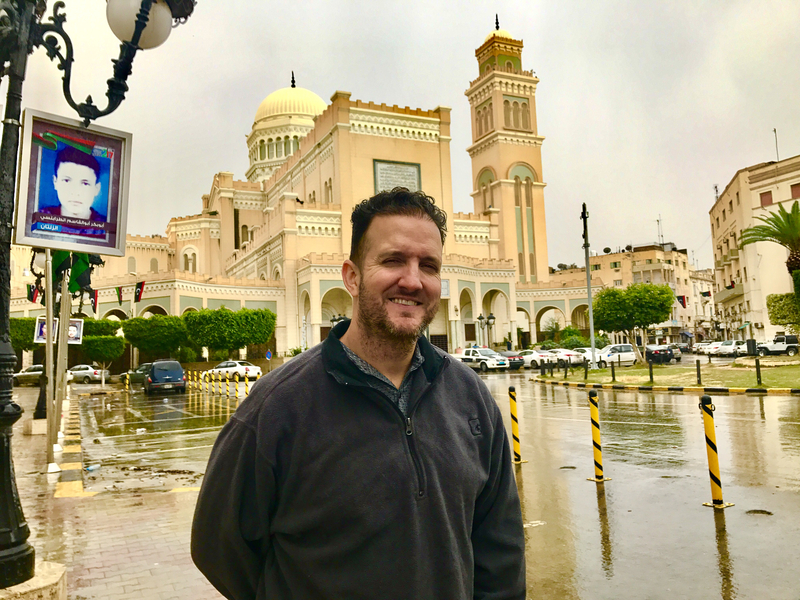 IMPORTANT NOTE: This article is part of a 12-chapter series on my trip to Africa: Libya was the eleventh country of twelve African nations I visited in December of 2016. It’s best to read the chapters in order, as they build on one another. To see countries number one through six, please go HERE. It’s best to read the stories/countries in order. The moment of truth: at Tunis Airport boarding for Libya. The captain let out three Allahu Akbars in a row. My spine tingled. The cabin door had been closed. There was now, officially, no turning back. There are a million and one chances to bail on a trip, including until and up to, being in your seat on the plane. As long as that cabin door is still open, you’re free to just get up and leave. But once you hear that unmistakeable “ker-clunk,” you realize that you’re now going through with the trip whether you like it or not. So why Libya? 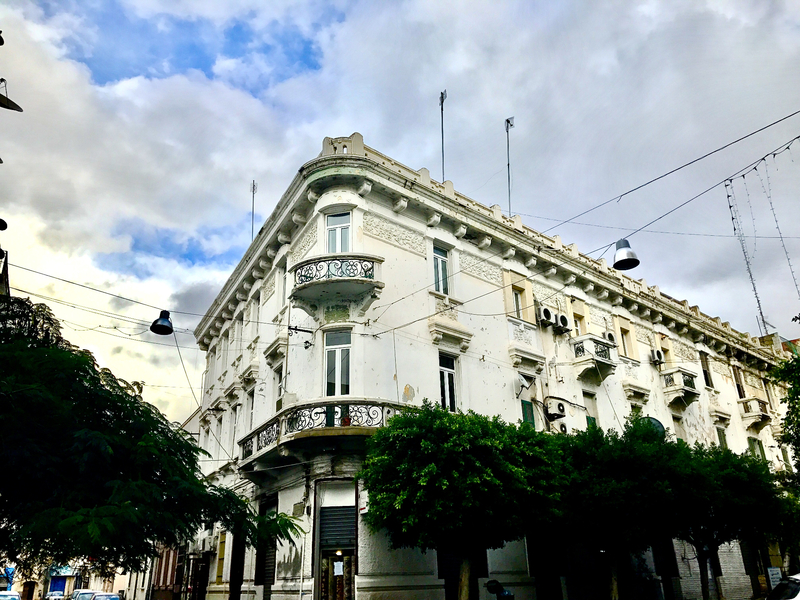 With so many other awesome destinations in the world, why was I going to one of the most unstable nations in the world at the worst time possible? 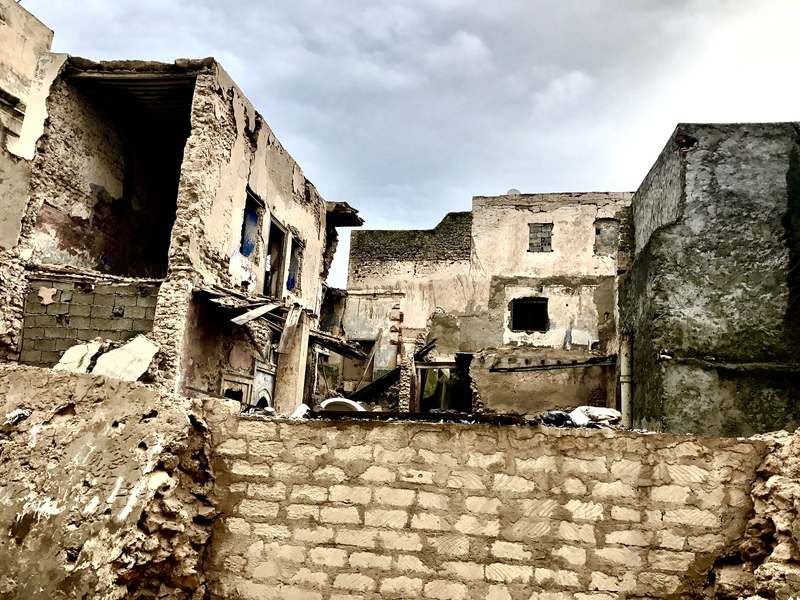 Since Gaddafi’s death, the country has been fighting a civil war between rival militias, making Libya one of the least-safe places in the world. It’s one of the only countries in the world that doesn’t even have an official “government.” So why in the world would I want to go there, now? The answer, albeit a dumb one: I was just too close not to. 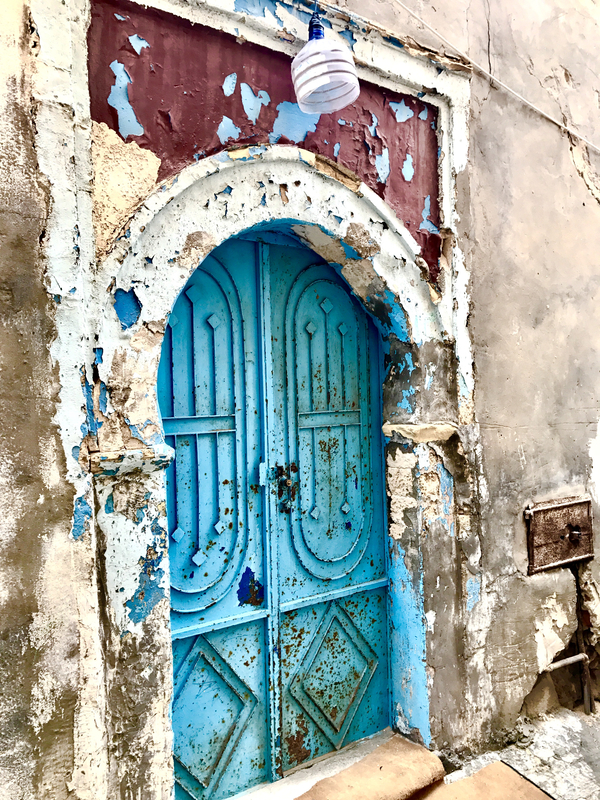 I’d booked a 12-country journey through West Africa but because of a flight change, had to re-route myself North, going home through Tunisia…and that was the closest to Libya you could get! 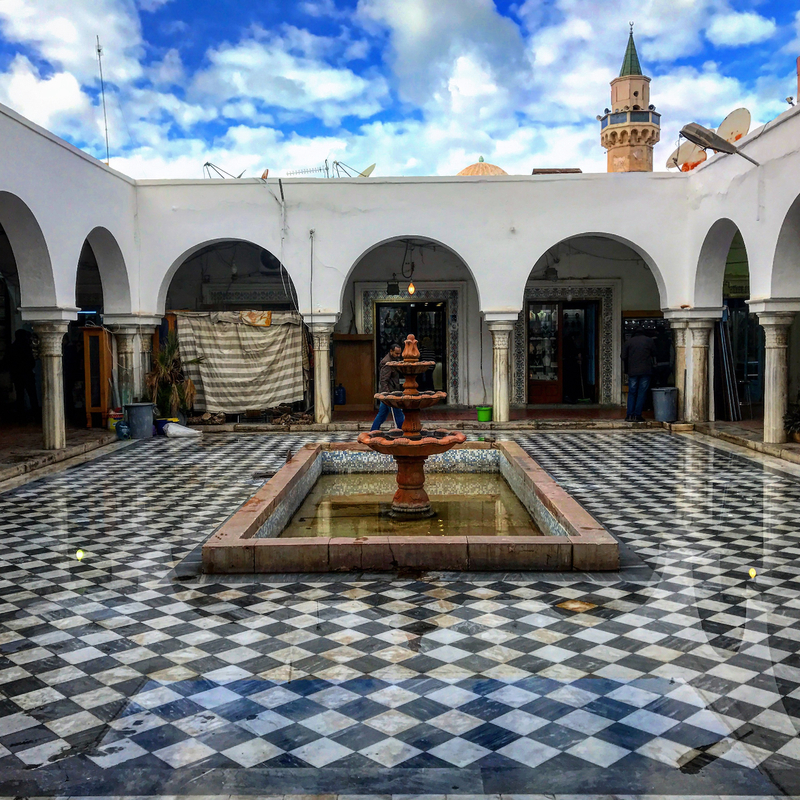 Tunis to Tripoli would be like a flight from LAX to Las Vegas. I couldn’t resist at least investigating a trip into Libya! Unfortunately, I have a record of “dreaming it, then doing it.” Yup…weeks later I had my airline tickets, visa and hotel reservation. 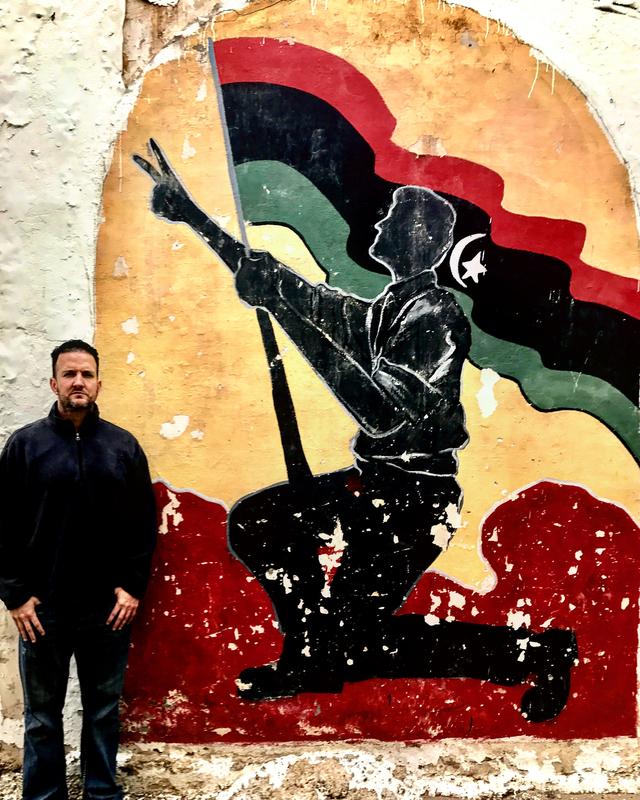 I was actually going to visit Libya…one of my proudest (or dumbest) WTF moments of my life. 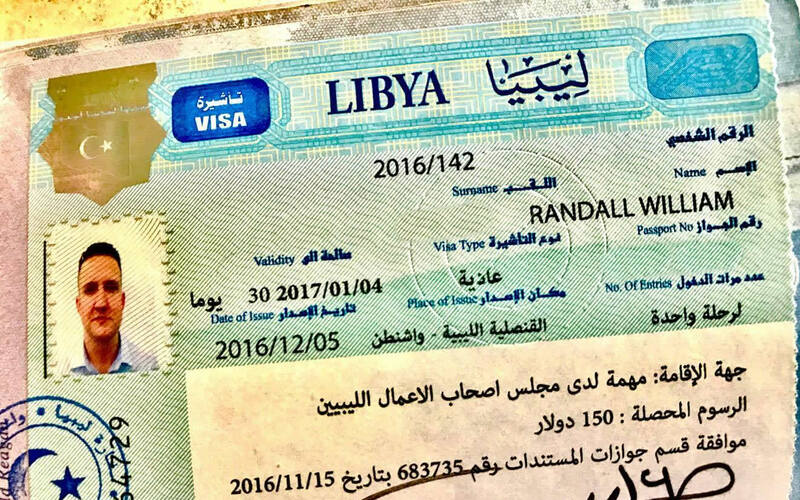 Libyan business visa. Tourist visas are no longer being issued. But this was no easy task. Booking a trip to Libya proved harder than North Korea. For obvious reasons, the country had stopped issuing tourist visas altogether. That should have been my first sign not to go, along with The State Department’s warning for all Americans to “leave Libya immediately.” What the f___ is wrong with me? Nope, I found a tour company who’d actually get me a business visa to enter the country. Seems legit. Weeks (maybe months) later, a bank wire to the tour company, an official invitation by the Libyan Businessmen’s Association, and an application and check to the Libyan Embassy in New York; I was all set to go. The in-flight meal did little to calm my nerves, but did take my mind off things for a few moments, while I tried to figure out what the cold, cut-up, omelet-like cake was. Turned out it was just that: a cold, cut-up, omelet-cake. Hey, a scared-to-death guy with a full stomach is always better than a scared-to-death-guy with a rumbling stomach. I appreciated the fact that these African airlines fed you meals on such short flights. You had to eat fast; wolf down your food by the time the flight attendants passed back down the aisle to clear your tray ten minutes later. 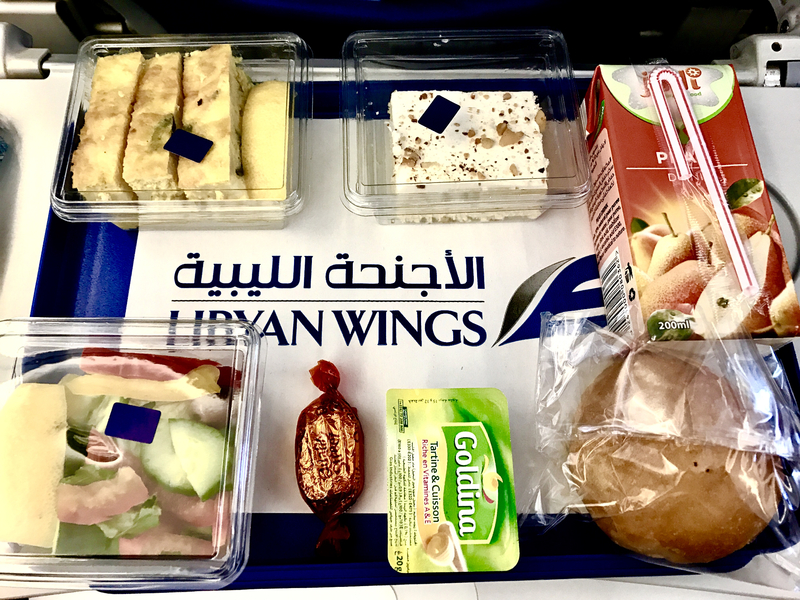 My meal for the hour flight from Tunis to Tripoli. 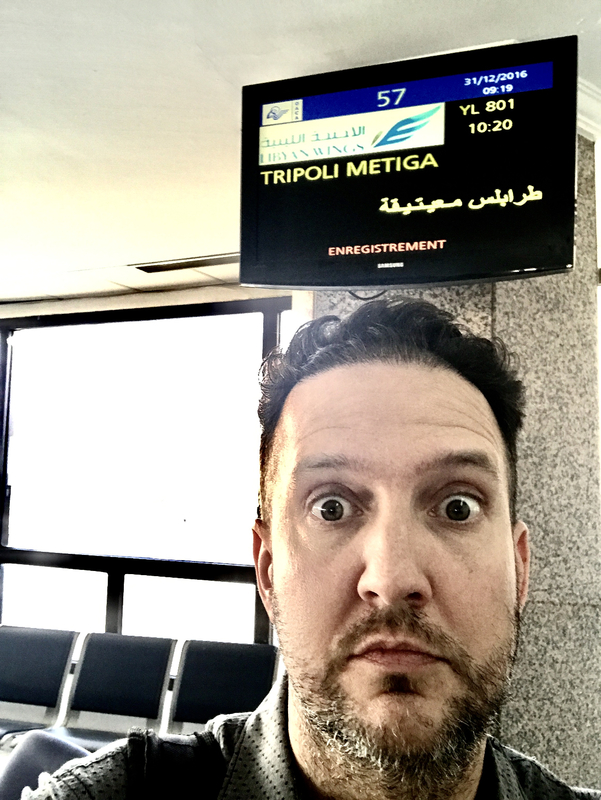 So yeah, here I was on a flight into Tripoli, ignoring the dozens of signs I’d received not to go during the weeks before. Friends and family urged me not to go. The State Department describes it as a no-go zone, and warns that you’re on your own if you choose to go. What even freaked me out more were the people I met in Africa that sternly warned against going there. Everywhere I went, everyone told me “not now.” The two biggest signs happened in Ghana, where when I checked into my hotel, CNN was playing on the monitors with news of a Libyan hijacking in-progress—on the same airline I was booked on! That was definitely a sign. Then, at the airport in Ghana (on the way to The Ivory Coast), I approached a passenger checking in for their flight to Libya, and asked their opinion on my trip there. 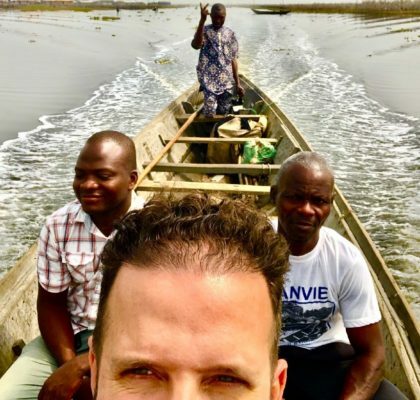 Turns out the guy I asked actually owned an African tour company–so he was an expert–and you guessed it, he sternly told me not to go. Finally, the night before was actually my original flight to Libya, and I missed it. The plane actually had already left without me, an hour early! How many signs had to happen before I actually got the hint that now maybe wasn’t the best time to visit? But despite all these signs–big ones, too–here I was, coming in for landing at Tripoli’s Mitiga Airport. Oh, and Mitiga‘s not the main airport…you see the main airport actually got blown up, so all flights are temporarily using Mitiga. Lovely. The thing that I was most nervous about was getting in and out of the airport. Through my research I’d learned that different “militias” controlled different parts of the country, including the airport. How would they treat an American trying to enter and exit the country? What’s worse is that a couple contacts even told me stories of immigration accusing some foreign visitors of being spies upon entry! After all, what other business would any foreigner (especially an American) have traveling to Libya. Alone. Of course they’re gonna think I’m a spy. 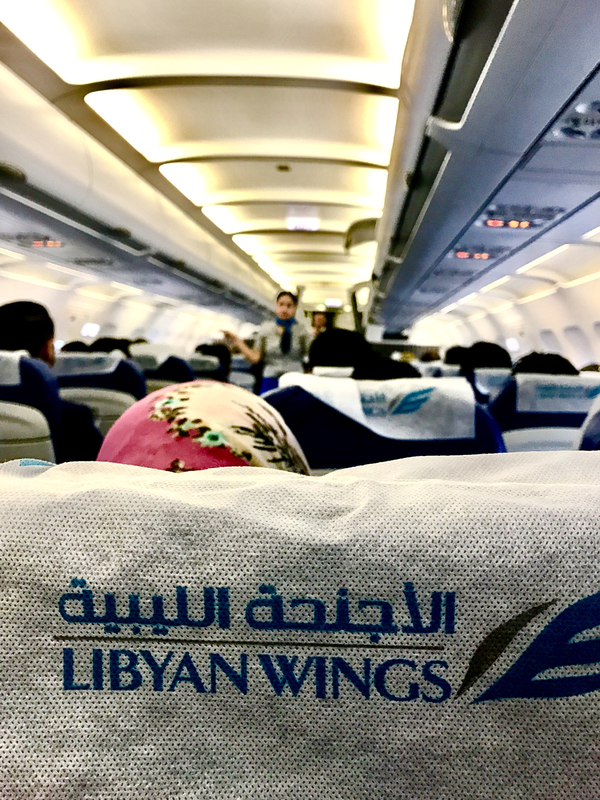 Observing the safety instructions aboard this Libyan Wings flight. Truth is, I’ve never been so scared in my life. At least when I flew to North Korea there were other tourists on board, and I was visiting under an official government sanctioned tour. This trip, on the other hand, was straight out of a James Bond movie—except I’m not as handsome and have a bad back. What could go wrong? But, to my surprise, going through immigration was a breeze. In fact, I was the only person in the “Non-Libyan Citizen” line; for good reason! Sometimes, going to unstable countries has its benefits. After I got stamped through immigration, it’s the second moment of truth: when you walk into the arrival hall of the airport and you’re official “in.” This is always kind of scary in any sketchy country, because it’s the point where you’ve left the confines of a secured area, with strict airport security and uniformed government officials; to be thrust into a sea of locals, including hustlers trying to scam you with expensive taxi rides and black market money exchange deals. It’s like jumping out of a plane: you can’t turn around and you just have to power through it. Now’s the time to put your game face on and look like a local, or at least look tough and pretend you know what you’re doing. But of course I didn’t know what I was doing. I just knew I had to meet my contact, Salem, and that he was supposed to be standing right there, holding a sign with my name on it. But there was no sign anywhere in sight. I’d braved the Caracas Airport (proudly awarded “The World’s Most Dangerous Airport” title), so I knew not to panic. Just act natural. But of course inside my heart was racing and my inner voice simply saying, “F___, f___, f___, f___.” No one was waiting for me. I had no other option but just to wait. Taking a taxi into town alone was not an option and I’ve learned in extremely dangerous places like this you talk to no one. When my heart rate slowed just a bit, I pretended to make a phone call while recording video on my phone of the airport. To make it worse, there was no WiFi, so I couldn’t contact my tour guide through WhatsApp or email. I figured worst case scenario I could just board the next flight back to Tunis. But alas, minutes later, through the crowd surfaced a 50-something gentlemen wearing a Members Only-looking jacket and a sign that read my name. This was Salem, one of my guides, and boy was I happy to see him. We shook hands and then popped up Yousef, my second guide. We were ready to roll. The first drive into a town like Tripoli or Caracas is always one of great fear and paranoid observation, at least for me. It’s the first look into a new town, and you feel like a cat who’s left his house for the first time, treading lightly and looking around at everything. In the case of Caracas, we hit a roadblock with soldiers toting machine guns the first mile out of the airport. Luckily, our drive into Tripoli was uneventful. 15 minutes later we were parked and I was now standing under The Arch of Marcus Aurelius. Still standing, right in the center of town, I couldn’t believe this marble structure was erected in the year 165 A.D! And I was standing under it, taking selfies with it, touching it…in Libya! And there wasn’t another tourist in sight. Absolutely incredible. All at once, it was this very moment that reinforced my reason to travel the way I do. Now, the months of doubt and intense paranoia all seemed worth it; the trepidation and fear quickly transformed into appreciation, excitement joy and humility. Sort of a “mouse who got the cheese feeling;” risking life and limb, to finally taste that sweet reward. 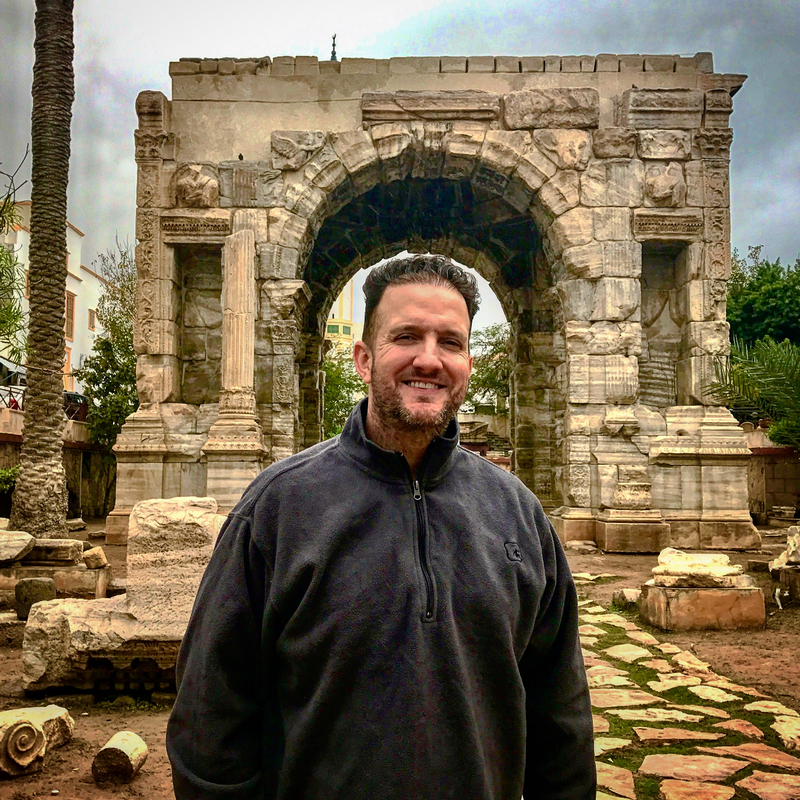 First look: Arch of Marcus Aurelius. 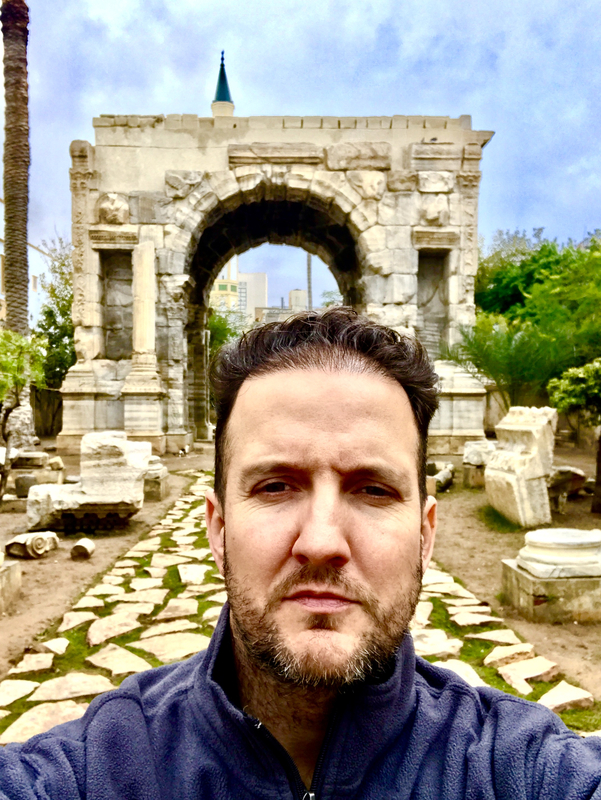 Arch of Marcus Aurelius was erected in 165 A.D. 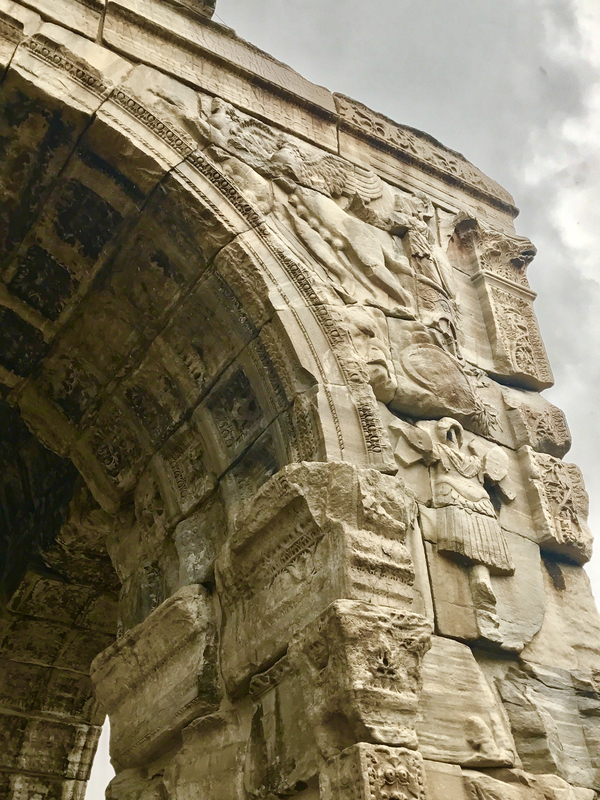 Inside the Arch of Marcus Aurelius. 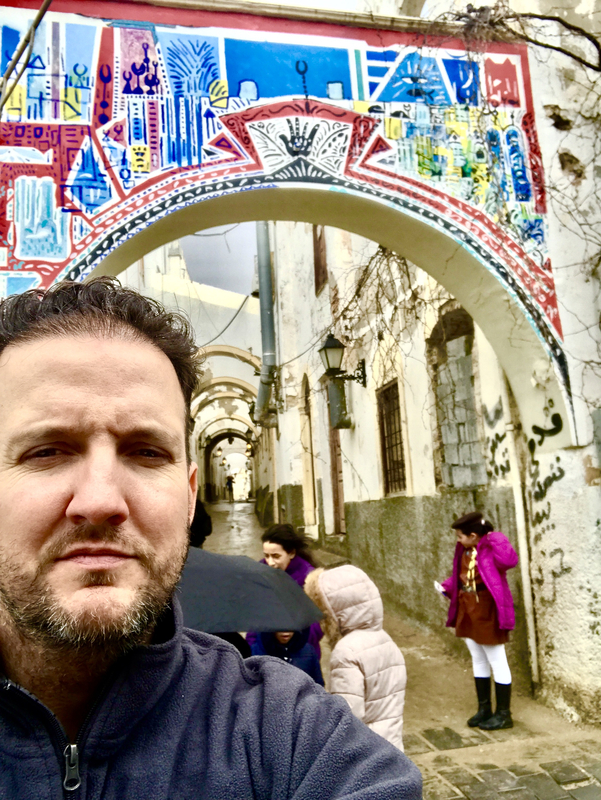 For the next two hours, Salem, Yousef and I strolled through the Medina and marveled at the ancient buildings, many of them crumbling before our very own eyes. Yousef was an expert in architecture, and I wish I had recorded his lectures as we walked. He’d note which buildings were constructed by the Italians and which were from the Ottoman Empire. 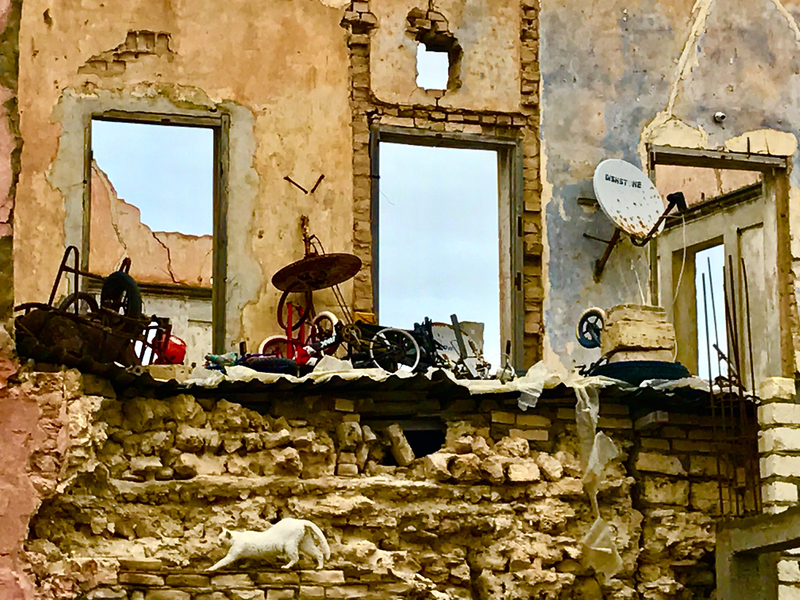 He was genuinely heartbroken that many of these structures were collapsing and beyond disrepair. 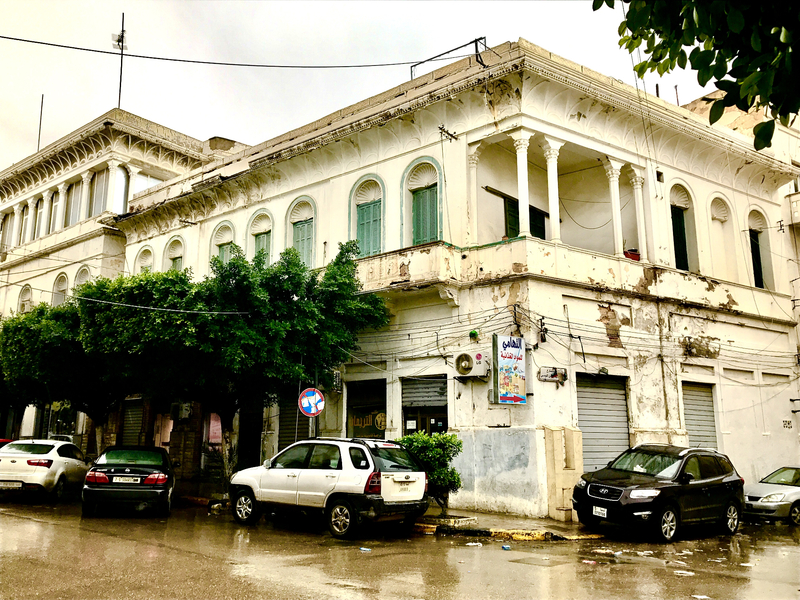 The crumbling structures of Tripoli’s city center. A plastic water jug acts as a light for this entry way. 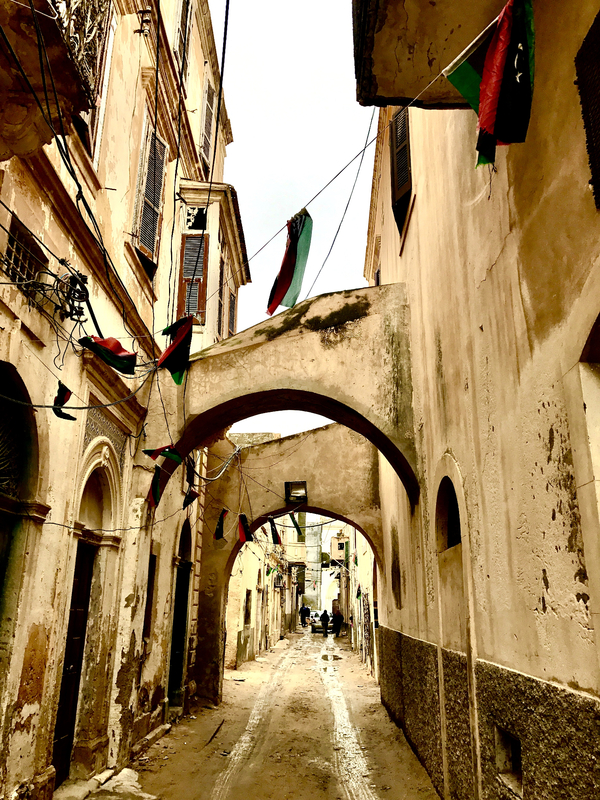 The wet streets of Tripoli. 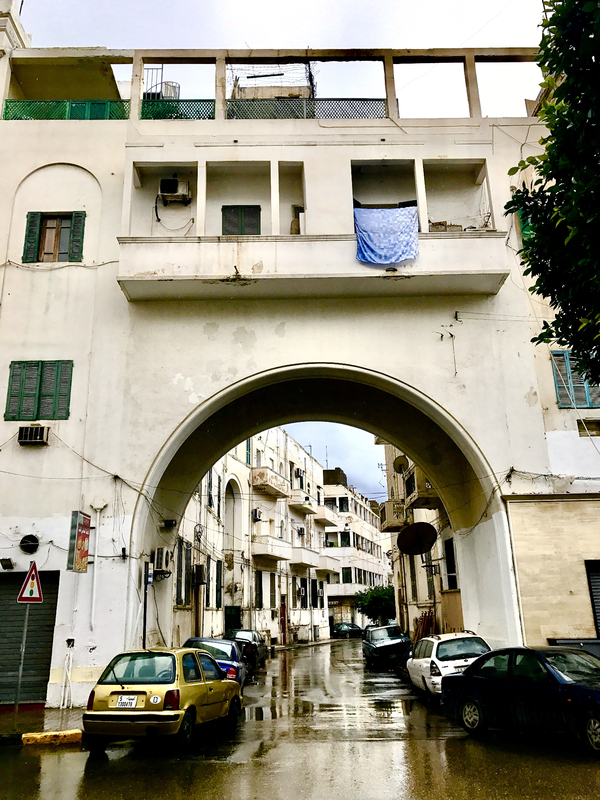 Entrance to apartment complex in Tripoli. So much beautiful architecture to admire at every turn. 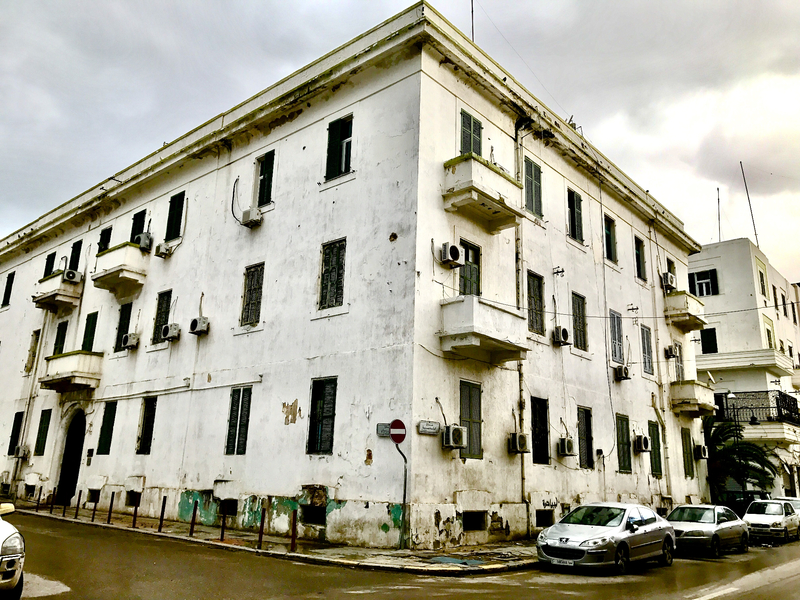 Yousef also pointed out that many of the buildings had been taken over by squatters since the war; and that most of the new structures under construction were being built without a permit, or even ownership of the land! People were just putting up new houses and apartments, by their own free will, without permits, zoning, or even buying the lot. 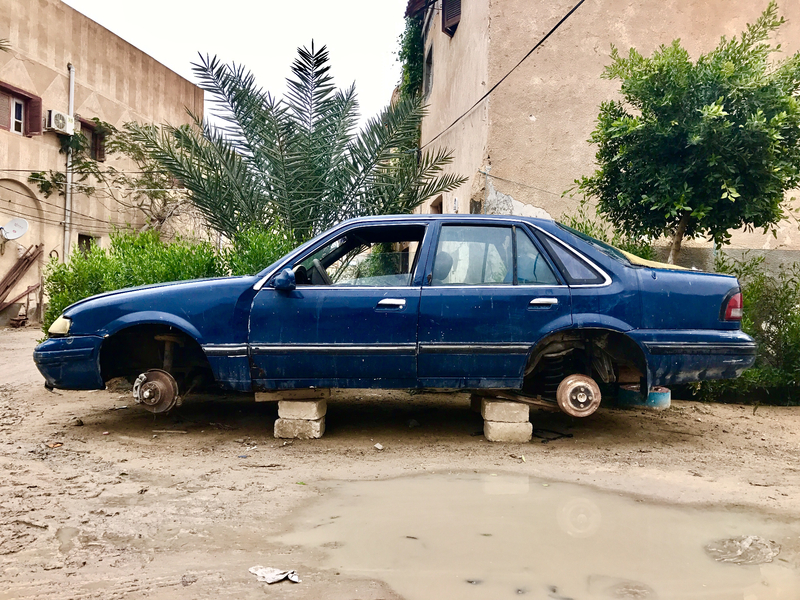 There was simply no one to enforce the laws, so Libya is more or less a free for all at the moment. While exciting, this reminded me that I needed to be extra careful and on my guard more than ever. Who’d help me if I got in trouble? Glad I got the rental car insurance! A painting featuring the new Libyan flag, changed after Gaddafi’s fall. Libyan flags strung over this corridor. The narrow alleys twisted and turned as we passed locals of all ages going about their day. Unlike Caracas where I was limited on where I could whip out my iPhone and snap photos, my guides gave me free reign to shoot anything I wanted, except police and military, of course. Out of habit, I still asked each time, before snapping away. 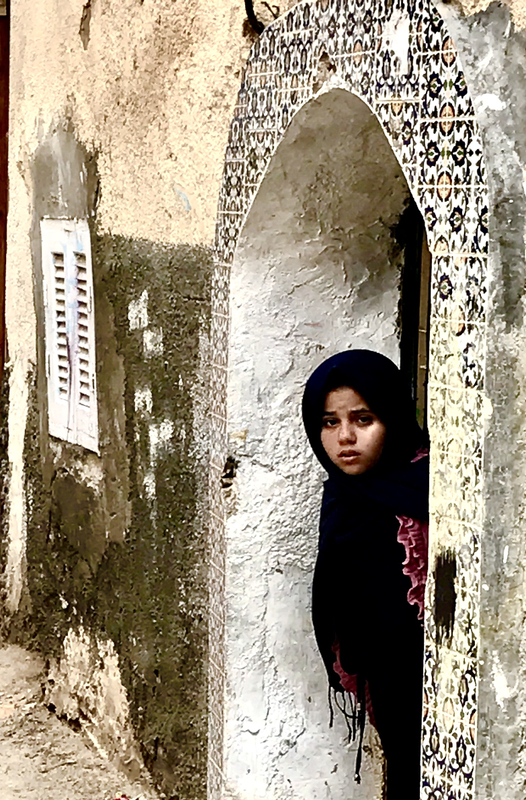 I’d learned from my trip to Algeria that it’s not a bad idea to take pictures with women in the frame, so I had to time my shots just right. 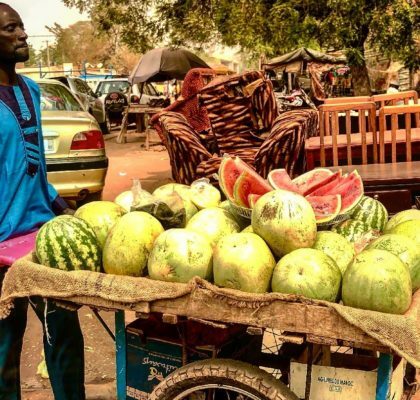 I’d already been scolded at least a half dozen times throughout my journey through Africa, I was getting used to taking pictures quickly and discretely. A girl surveys left and right before exiting her house. Yousef was so insightful when it came to Libyan history and I learned so many new and fascinating things. We passed an old synagogue as we strolled through the old Jewish quarter. Yousef showed me the Jews’ special “exit” out of the neighborhood, through the back. This was all of course, before they were expelled from Libya, and even worse. Also very surprising was stumbling upon a Christian church that was open for business! 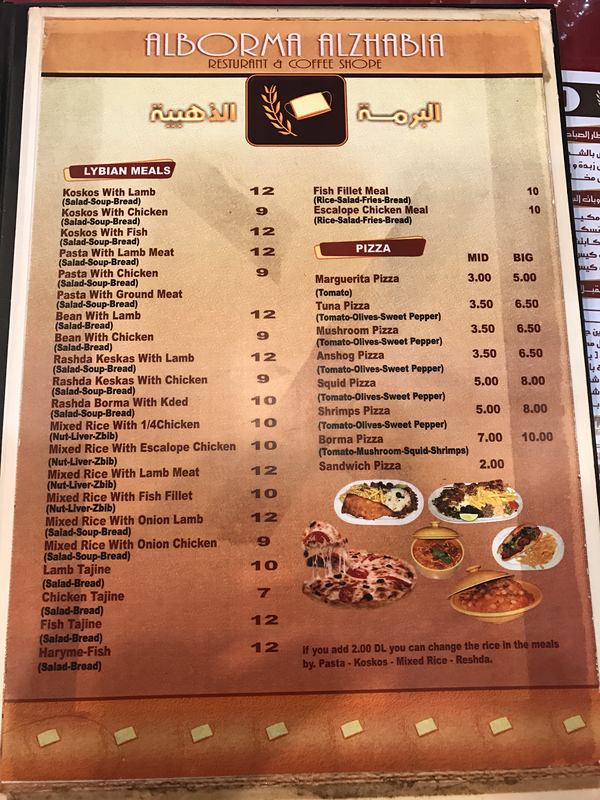 Yousef told me that we were so fortunate that it was open; it’s been closed since he can remember. The head priest, David, who had come to Libya from India to run the church, invited us in. 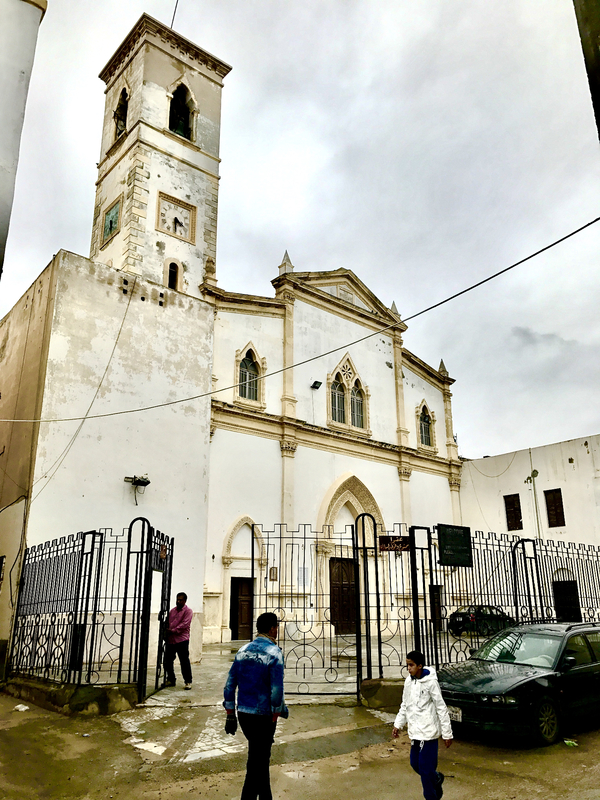 I was surprised that Christian churches even existed in Libya, and David explained some of the rules, including not being able to ring any church bells. The churches also were forbidden to display the cross on the building, or even send out printed literature bearing images of the cross. I don’t know what I found more fascinating: the fact that Christian churches could be found in Libya, or that they were forbidden to do normal “church things” like ring the bell or bear the cross. 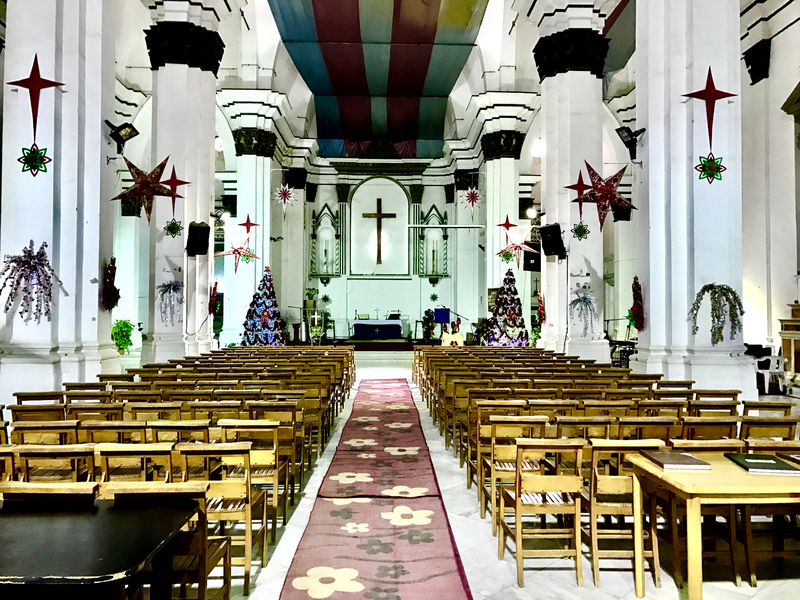 Christ The King Anglican church, Tripoli. I was lucky enough to be granted access inside. 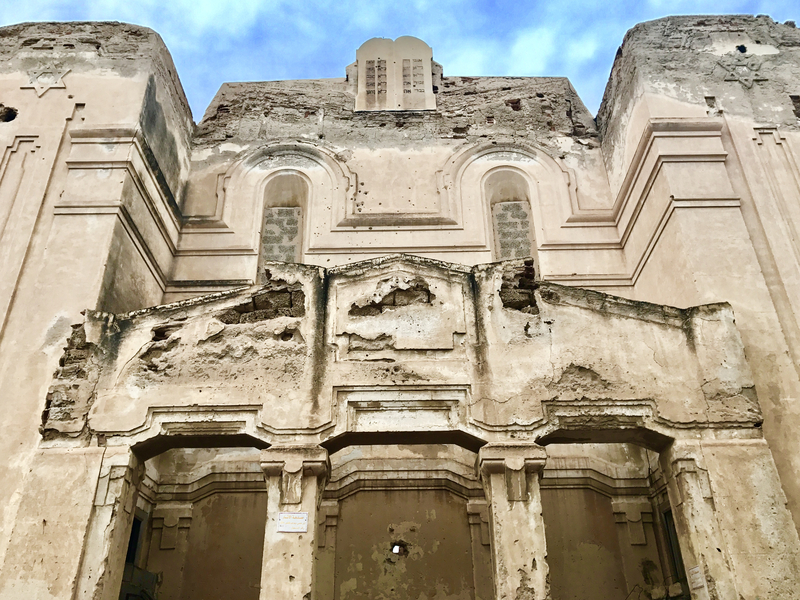 It felt surreal to be inside a Christian church in the middle of Tripoli. 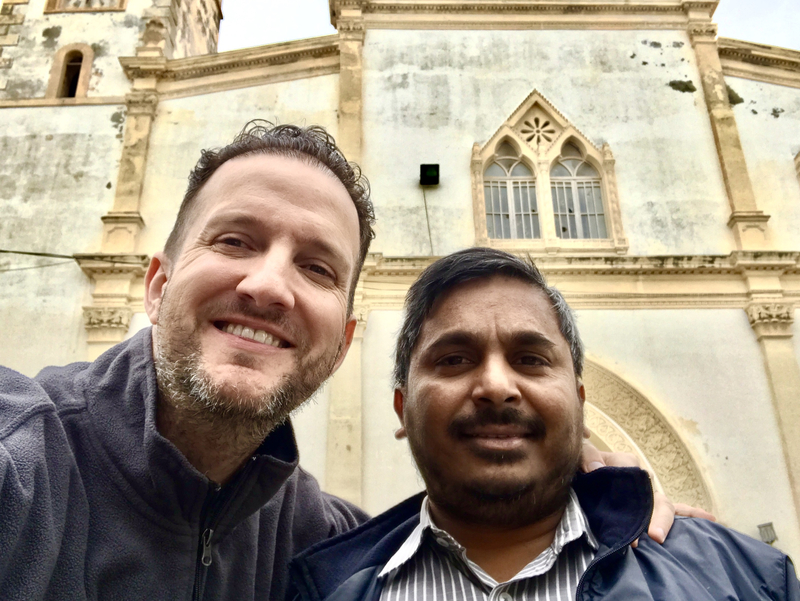 Me and my new friend: Priest in Charge, Vincent Jacob Rajan. 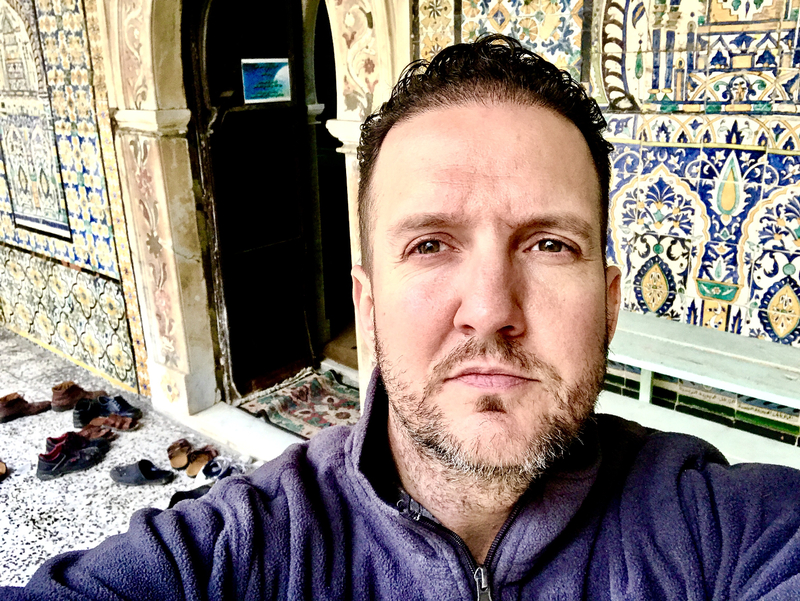 Next, I was invited inside a mosque, which made me kind of nervous. I’d always heard that only Muslims were allowed to enter mosques, and had visions of getting arrested and hauled off to Libyan jail for being somewhere I shouldn’t. 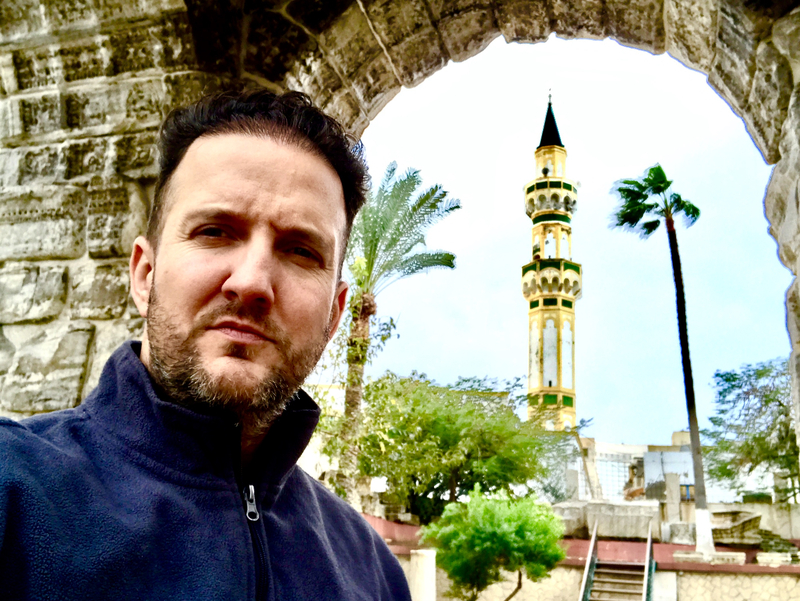 But that didn’t happen…instead I was able to remove my shoes and follow Salem and Yousef right inside, and observe the mosque and all its beauty from the inside. It was really cool! In front of the mosque I was able to enter with my guides. 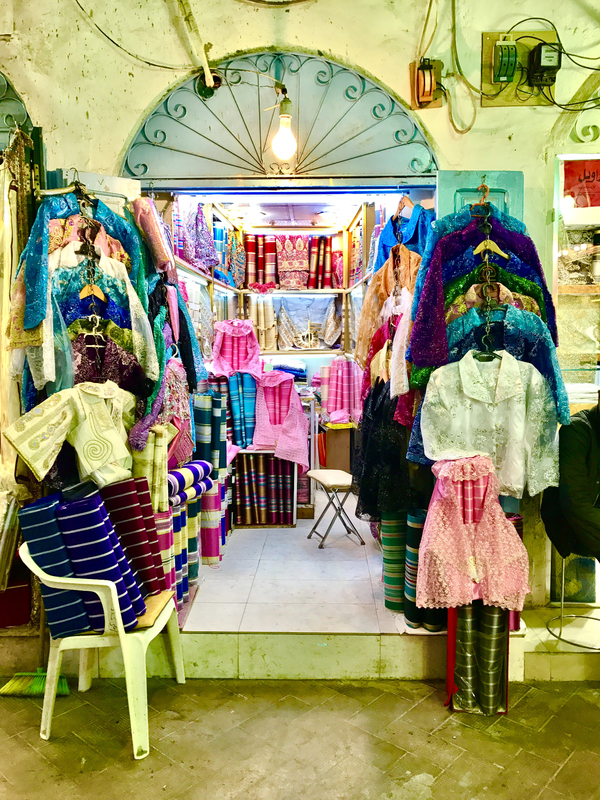 Next, we strolled over to an indoor market that had dozens of stalls selling gold, then copper, and then a row of hallways selling beautiful textiles. I popped inside a souvenir shop and loaded up on goods. I was out of room in my two small bags, but I just had to bring something back from Libya. I bought some magnets, a beautiful Libyan engraved plate, key chains, a passport cover and a Benghazi souvenir photo book. I didn’t know how I was going to get all this stuff home, but figured if I had to lose some clothes to make room in my bag for my new Libyan finds, I would. 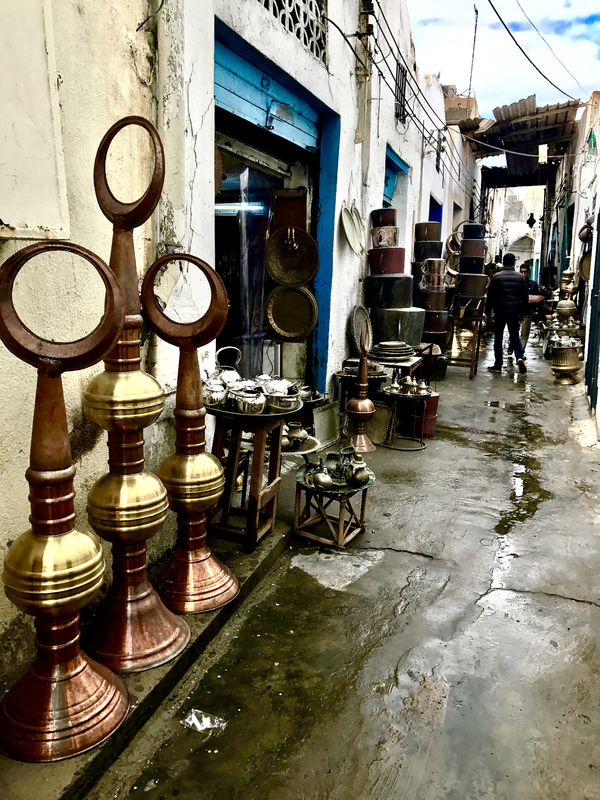 Minarets on display at the copper market. We ended up in the main square, which was pretty busy. I saw lots of families with kids, feeding pigeons and walking about. I felt hopeful seeing some small joys present: a cotton candy salesman and vendors selling balloons and toys. It was nice to see such fun, yet simple things present, in a place that’s been torn apart by a civil war and such uncertainty. The Martyrs’ Square; known as Green Square under the Gaddafi government; Independence Square during the monarchy; and originally known as Piazza Italia. If you’re not paying attention, you’d miss these: national fascist party symbols on the side of buildings downtown. After some more walking and observing the variety of architecture that served as a real-life history lesson, it was time to eat. 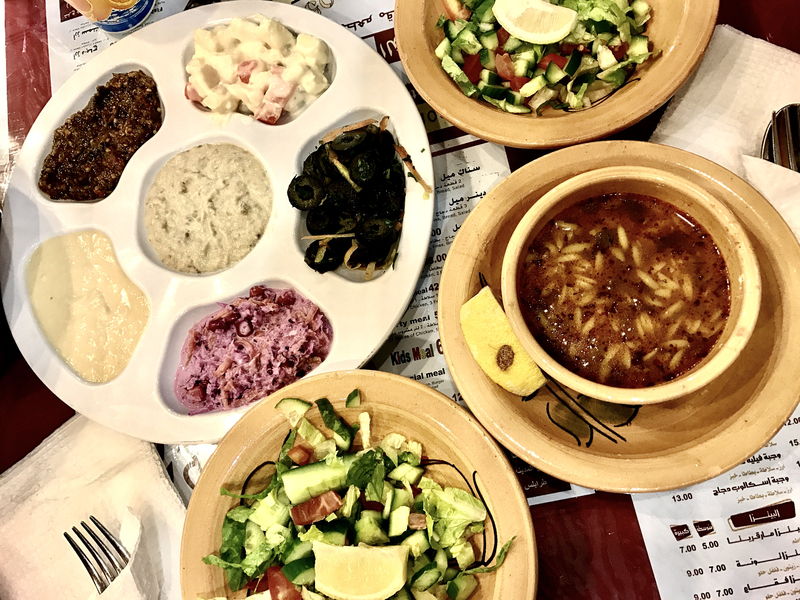 We jumped in the car and headed over to a local joint for a full table of local fare, including salad, lamb and rice. I was starving and left the restaurant very full. Great food, even better company. 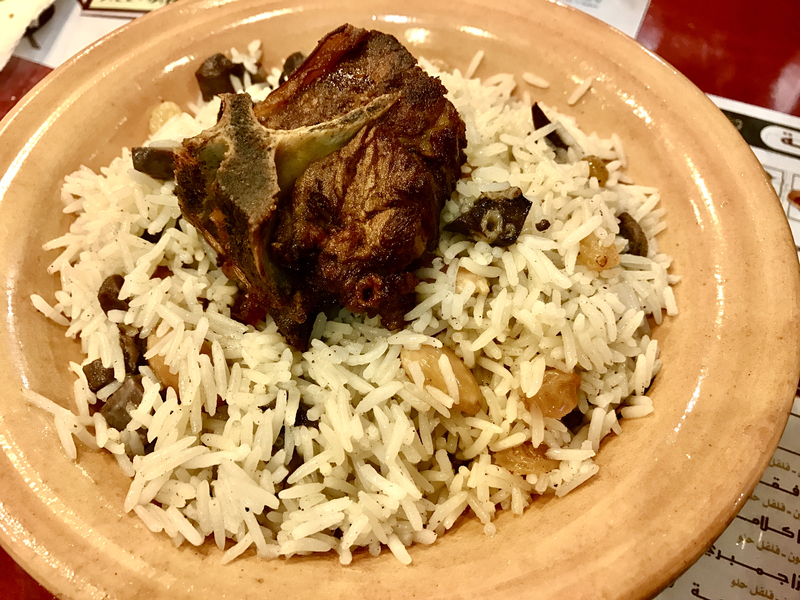 Tender lamb on a giant bed of rice. It was almost nightfall at this point, and time to turn in for the night. The guys ushered me over to my accommodations for the evening: The Awal Hotel. I think I must have been the only guest there; I didn’t see another soul in sight. The power wasn’t even turned on until I’d been in my room for a few minutes—everything had been dark. I guess when you don’t have any guests in a five-storey hotel, there’s no need wasting all that power. Yousef and Salem said their goodbyes, and I was left alone, to the confines of my room for the rest of the evening. It felt weird not going out on New Year’s Eve, but I didn’t even risk walking around the block by myself. Instead I stayed put, and took in hours of CNBC, one of the only English channels available. I never did get the heat working, and stayed under the covers, in my clothes. I had trouble sleeping. I still couldn’t believe I was in Libya. 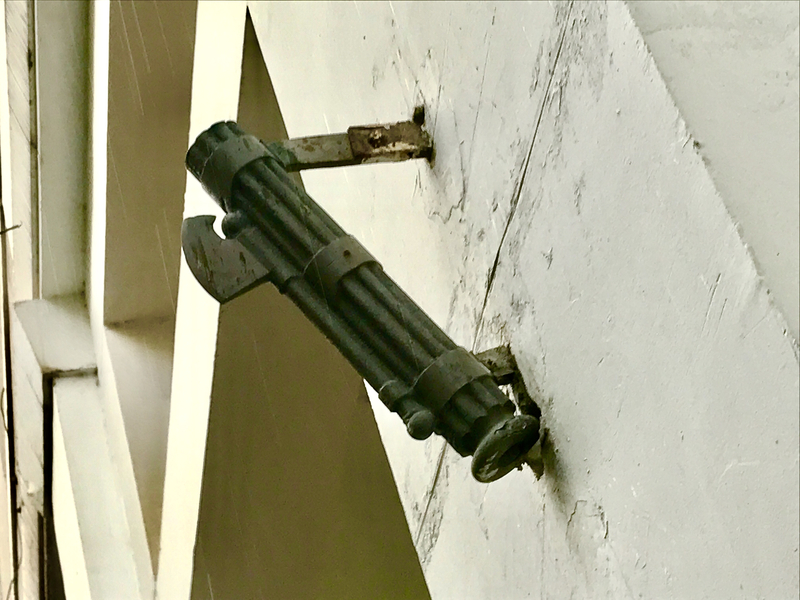 At midnight there was so much gunfire–celebratory, I assumed–it sounded like a battle was taking place. I finally fell asleep close to 2AM, and was up at five to pack my things, have a couple croissants, and ride to the airport with Salem. God bless Salem, what a good guy; he bought me a box of Libyan dates as a farewell gift and we had coffee at the airport before saying our goodbyes. I asked him to hangout in case I got jammed up trying to exit through immigration, and he obliged. Both Salem and Yousef were absolute pros and all around nice guys. 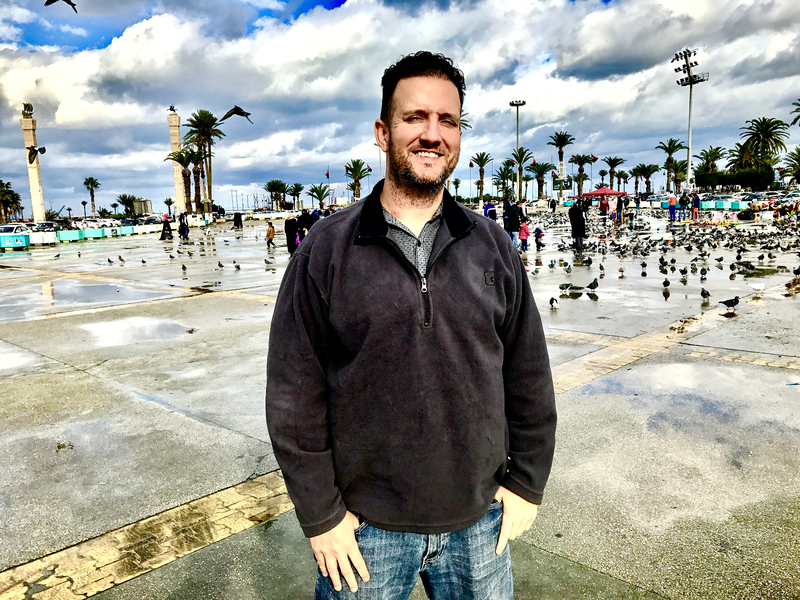 They were knowledgable, responsive and hospitable, and seemed to genuinely be happy that I was there. They told me that I was their first American tourist since the civil war. They took great care of me, and I will never forget them! Left to right: Randy, Yousef, Salem. Walking to the departure gate, I accidentally walked right past a checkpoint and got yelled at by a young soldier. Crap! I quickly trotted back over to him so he could check my docs, before he sent me on my way. Way to keep a low-profile, smart guy! I indeed did get jammed up at immigration while trying to exit. They asked me to step around to the other side of the desk. I did, and they commenced searching my bag. They took everything out. I mean every…thing! From rifling through my toilet kit, to going through all of my documents, the officer–sans uniform–went through my bag with a fine tooth comb. He seemed to really have issue with my bag of souvenirs. He asked what the refrigerator magnets I’d bought were, to which I responded, “Umm, refrigerator magnets?” I wondered if he had any clue what I was saying. It got real when he pointed to the image of a man’s face on the magnet and sternly asked me, “Gaddafi???!! !” He looked concerned/angry/confrontational. Holy crap, my heart stopped. Gaddafi was still a very polarizing and sensitive topic for Libyans. Did I buy the wrong souvenir? Would this fridge magnet be the reason I got locked up? “I don’t know,” I quickly replied. Then he laughed. Maybe he was just goofin’ with me? He did confiscate my new plastic passport cover that said Libya, telling me that since I wasn’t a Libyan citizen, I couldn’t have it. It was just a souvenir, but I wasn’t gonna argue…take it! He also was having a hard time understanding what my packet of Emergen-C powder was. “Vitamins,” I answered. When he didn’t understand, I answered again, but this time in Spanish. “Vitaminas,” I said. I don’t know what I was thinking, we weren’t in Mexico. When the officer excused himself and headed into an office with my passport, I really got nervous. “Here comes the spying accusations,” I worried. But thank God, he came back, gave me my passport, and waved me through. I swear those last five minutes took ten years off my life…talk about tense! Thirty minutes later it was wheels up and back over to Tunis. I’d done it. I’d really done it. Against the advice of many and a million signs, I’d made it into Libya, and back out. What a beautiful country with such a fascinating history. Let’s pray for the good people of Libya, that they may receive the stability and peace they deserve. I left with so many more questions, so much more to learn, so much more to experience. That small taste just made me hungry for more. I’d love to return someday, and spend much more time there…and buy many more refrigerator magnets. Interested in visiting Libya? Do your research first, and if you still want to go, contact Sherwes Travel here. Tell ’em Ramblin’ Randy sent you. 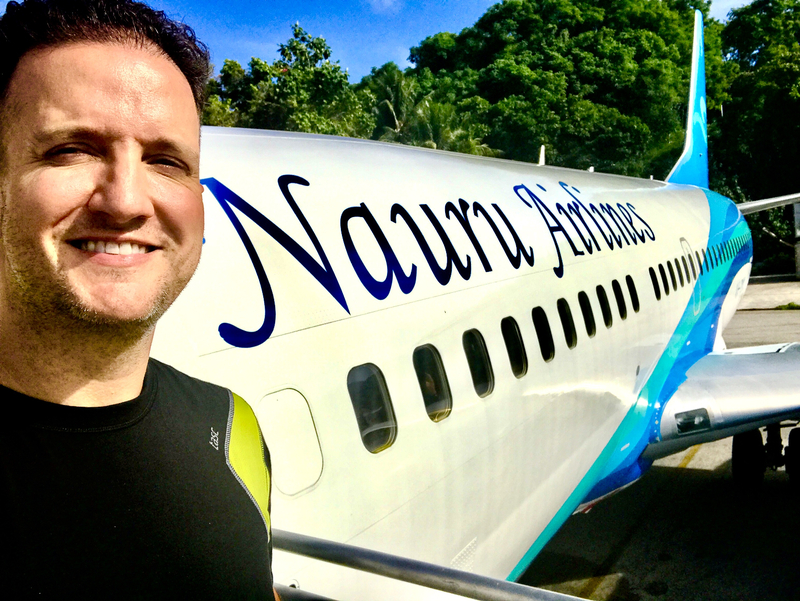 So You Wanna Go to Nauru? Awesome Dub! The picture of the girl in the doorway looking right and left before she exited sound be in national graphic. That, to me, was the most amazing photo. Good capture! Man, thanks so much!!! I was lucky to catch that. Africa was the toughest place I’ve ever been to, when it comes to taking pictures of other people. Yet another amazing story, Randy! There is a Canadian travel show called “Departures.” The two hosts actually explored around Libya in Season 2 sometime in 2008. Gaddafi was still in power, of course, but was starting to open up the country to Western tourism. I really wish I had jumped on this opportunity before the Civil War, but hindsight is 20/20. Look this show up on Netflix. You’ll really enjoy the other parts of Libya you couldn’t see this time around. Let’s hope peace and prosperity return to this beautiful country soon! I’ve seen the show…love it! I’ll have to watch the Libya episode. Thanks for the read Weech. And yes, God bless the good people of Libya! Haha… You went to Libya and never felt unsafer and I went to Toronto and never felt safer. Talk about opposite ends of the spectrum. Great read, as always. Glad you’re back safe. Opposite ends of the spectrum, for sure! I’m very glad that you follow your heart against my advice at Accra Airpot , i’m very proud of Mr.Salem for what he done for you , Libya is Great Nation with great history and what is going on here is abnormal we pray to back to normal. We hope to see you soon in Libya to visit the other wonderful places. I was so lucky to meet you Dr. Derar! And I really did appreciate your advice! I hope we keep in touch. Thank you for Visiting Libya. Hey Rajan! How are you doing?! I just realized your are the gentleman that I met at the church…Hey!!! 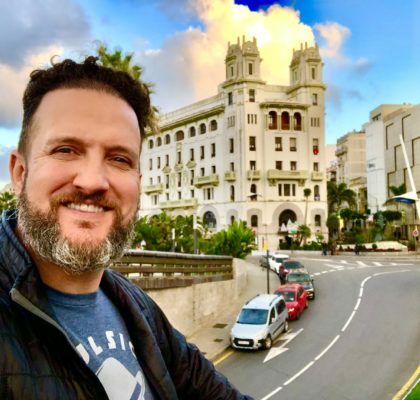 What travel company did you use if I may ask? Sherwes Travel. Tell them I sent you. They handled everything. 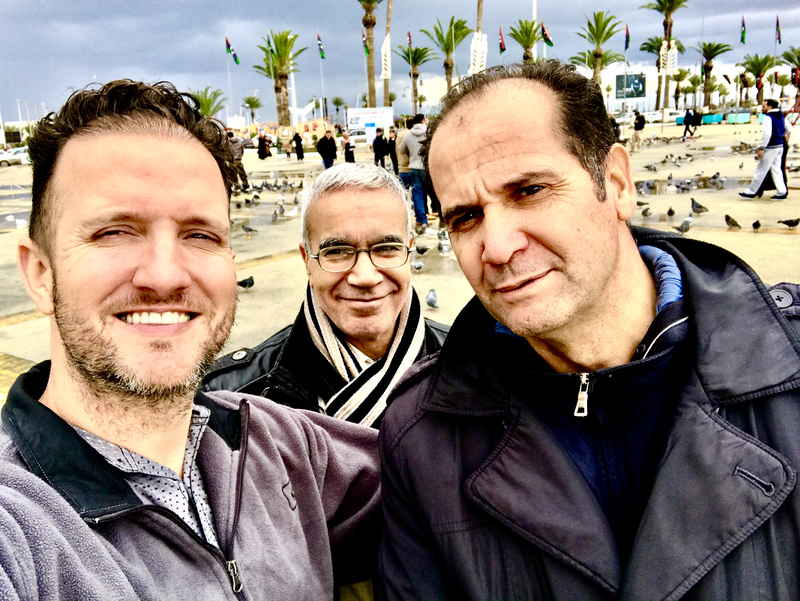 That was really great, what an adventure – Salem and Yousef seem like great guys! Tripoli and the ruins close by have been on my wishlist for years. I think I may prep some research and look into going something in the next year. Fingers crossed the security situation stays stable. Yes, they were awesome. I don’t think they realized what a scaredy cat I was, the whole time. The whole experience was just so surreal. I’d do it again in a heartbeat. I have since referred at least half a dozen folks to Salem and Yousef and all have enjoyed. Do let me know if you end up going, I would love to hear about it! So good to hear all these nice comments about Libya. I believe 2018 will finally be the year that we see big changes in the country which will make your trips relaxed and enjoyable. There is so much history in Libya. Please do get in touch and we will be happy to assist . Randy, I hope you don’t mind me putting forward our website. Thanks for coming through, Abdo! Not at all, thanks Abdo! 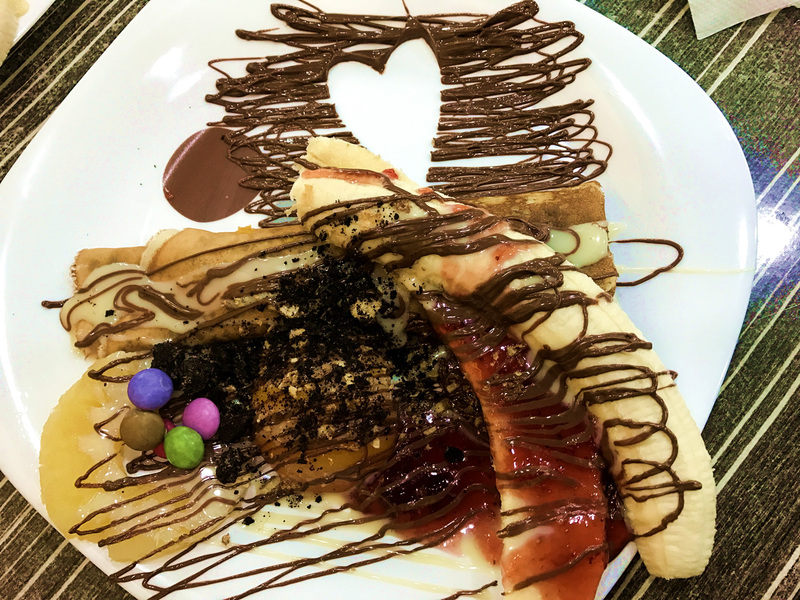 Oh wow, that must have been amazing! Beautiful city, I do hope to return and spend some quality time. Thank you!